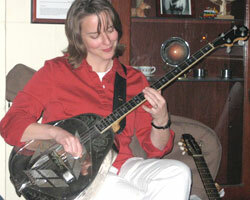 I started playing 4 String Plectrum Tuned Banjo when I was about 13. "My cousin in Michigan sent me a four-string banjo, a tenor, that he didn't want any longer. I decided that if I couldn't play ragtime piano, maybe I could play something like it on banjo, like the records (Bunk Johnson & Lu Watters) my dad gave me." "I discoverd a four-string banjo teacher, Harry Tenbarge, who was a member of the Evansville Dixieland Society, which had the only Dixieland band in town. He played plectrum style. I just tuned my tenor like his. I didn't know the difference." "A lot of people would ask if I doubled on guitar. I thought I should; it would make me more marketable. So two years ago, when I heard that Rebecca Kilgore was teaching guitar at the Adult Swing Camp put on by the jazz club in San Diego, I thought: If I could only do what she does! Not fancy, just perfect. The right changes, a lot of finesse. I signed up." Jamming with Hertz, the shop owner of "Vintage Guitars" at his store in Paris, France. This remarkable video was created by my friend Julien. "I went to Swing camp again last year but they had a plethora of guitar and banjo students, so I ended up in a string bass class taught by Clint Baker. Later, he gave me one of his old instruments. I made my on-stage debut as a bass player at the Sonoma County festival last November." When David Boeddinghaus first approached me about performing in the show "Looking For Josephine" he asked if I could play Tenor or 6 - String Banjo. He wanted to music to sound authentic for the period (Josephine Baker's 1920's Review Show). I had been toying with the idea of learning Tenor tuning and I thought this show would give me the perfect opportunity to try it! By the time I went to meet and rehearse with the band in New Orleans (May 2006) I had enough of the instrument under my fingers to play it with the group. For more on my tour with this show, visit my "Letters From Paris" page. This instrument was made in the 20's for banjoists that wanted a "guitar" sound. The scale of the neck and the tuning are the same as my Plectrum Banjo, so I didn't have to learn a new tuning when I started playing this in the Reynolds Brothers Rhythm Rascals in 2004. I'm including it as a point of interest because it has an unusual look and sound. I play the 'National' exclusively on the Reynolds Brothers recording: "ZaSu Records No. 6" available on my Discography page. "Yes Sir, That's My Baby"
"When You Do The Wicky Wacky Woo"